These remarks are the public presentation portion of PhD defence. I remain thankful to my friends and colleagues for attending–they offered a crucial intervention, converting my anxiety adrenaline into performance adrenaline, or at least that’s how it felt. “On the map, their destination had been a stretch of green, as if they would be living on the golf course. No freeways nearby, or any roads, really: those had been left to rot years before. Frida had given this place a secret name, the afterlife, and on their journey, when they were forced to hide in abandoned rest stops, or when they’d filled the car with the last of their gasoline, this place had beckoned. In her mind it was a township, and Cal was the mayor. She was the mayor’s wife” (Lepucki 2014, 3). “I keep the Beast running, I keep the 100 low lead on tap, I foresee attacks. I am young enough, I am old enough. I used to love to fish for trout more than anything” (Heller 2012, 3). The first striking point of comparison is the gruffness and closeness of Heller’s first person to the distanced knowledge of Lepuki’s third. Curiously, too, this difference deepens when we notice that Lepuki’s narrator describes a couple, and, though Hig mentions his late wife on the first page, Heller’s is a confident solo pilot. Each character anticipates their future as much as they look back on their past. They express a relationship to fuel and are fixated on survival. California and The Dog Stars are examples of U.S. post-apocalyptic novels that fit into the literary fiction end of the form’s literary-popular spectrum. These two novels stand at one coordinate of what I am calling the contested politics of the post-apocalyptic novel. Popular U.S. post-apocalyptic novels have tended to include blight and toxicity as elements of their story worlds. There are stark examples, the gory death of anyone who feels that tickle of the Captain Trips disease in their throat in Stephen King’s The Stand (1978) or, looking back further, the barren deserts and anti-intellectual climate of Walter Miller Jr.’s A Canticle for Leibowitz (1964). Devastated story worlds are not only the stuff of the popular side of things. Cormac McCarthy’s The Road (2006) banishes any colour but ash grey from its landscapes. We find a different kind of devastation in Steven Amsterdam’s Things We Didn’t See Coming (2009) as the narrator muses on his colleague Julia’s vision of the future. She says her goal “is to connect the coasts and the north-south borders with great corridors of wild land—farms, forests, suburbs reclaimed by nature. One day there will be no more cities—their shells will be ghostly interruptions of the new nation, which will be composed of rural communities linked in all directions. Even if we aren’t here, the land will be: My money will keep it safe. When the rain comes back—ever the optimist—this is where her utopia will be” (Amsterdam 2009, 125). Amsterdam’s narrator relays Julia’s plan for the future despite the signal that their part of the world has been plagued by drought. In this way Amsterdam’s novel takes a step away from the blasted setting of the popular variants of post-apocalyptic novels. Cast between the craggy-rock worlds of earlier novels and the green hope of novels like Lepucki’s and Heller’s, Thing We Didn’t See Coming offers a tantalizing read precisely because it does not offer a revelation of what disaster has taken place. In each of its nine vignettes, there are hints that some major event has transpired, but the first person narrator has no vantage from which to determine what went wrong. Amsterdam’s novel recognizes that knowledgeable exposition has become a tired trope of the post-apocalyptic novel. Thus, through its formal innovation, Things We Didn’t See Coming differentiates itself from the popular strain of the post-apocalyptic novel, while thinking critically about what it can and cannot plausibly represent. The narrative form of the post-apocalyptic novel, how the story is told, lends it generic coherence despite this contest over what it can (or should) do. The work of British literary critic Frank Kermode on the apocalyptic provides a rich place to begin a formal understanding of the post-apocalyptic novel. In The Sense of an Ending, Kermode suggests apocalyptic concerns allow individuals and societies to locate themselves in space and time—we know where we are because we can see that we are headed for an ending. Post-apocalyptic novels undertake an inversion of Kermode’s apocalyptic narrative, beginning from the apocalyptic end and working towards resolution in a new origin. In the post-apocalyptic novel the origin of historical time within the story is identical with the end of the historical time of the reader. Put differently, post-apocalyptic novels develop claims about the present as they work through an interpretation of their historical conditions.Thus, we could say that the post-apocalyptic novel attempts to look beyond the telos, beyond the ending, of the apocalypse by distancing the confines of the present through an estranging, apocalyptic event. Their formal inversion generates a newly cleared space in which to imagine how social ways of being might change. I call this device cognitive reduction—the elements of life under late capital are stripped away, inviting imaginary scenarios to unfold in their place. Despite all of their setbacks, these novels still promise to engage in thinking beyond the apocalyptic imaginary outlined by Kermode, and that, to me, makes them worthy of our time and attention. Before I proceed too much further, I should answer two questions: why talk about the novel and why the U.S. post-apocalyptic novel in particular? I am a literary critic by training, and an explanation for why I took up the post-apocalyptic novel as the centerpiece of my study may not be needed in this company. However natural this decision seems, there was choice involved. I found that the novel allowed for me to avoid the sensational images of post-apocalyptic film (I have somewhat of an axe to grind about the Emmerich perspective so widely used in his and other apocalyptic films). Further, the novel has a rich history in grappling with historical change, which can be seen in the assessment of Sir Walter Scott’s historical novel by Georg Lukács and the description of “setting” in U.S. literary history by Phillip Fischer in Hard Facts. The post-apocalyptic novel offered the occasion for me to ask questions about history, form, and politics (which just so happen to be three of my favourite things). The United States acts as a geographic boundary for my dissertation for both practical and methodological reasons. As for the practicality of it, I had to limit the number of texts I would address in the dissertation: even a focus on the post-World War II United States meant leaving many novels out of the dissertation. The methodological reasoning was that United States has been going through a major historical transition in the late 20th and early 21st century. It has been moving from a phase of historical dominance as an economic and political superpower to a phase of uncertainty. Three particular moments of this change interest me most: first, the moment of U.S. dominance just after the War at the zenith of what has been generally called the American Century; second, the tightening grip of neoliberal dominance in the mid-1980s; and, third, the moment of free fall between the U.S. invasion of Iraq in 2003 and the on-going global financial crisis of 2007-2008. The coincidence of U.S. decline and a veritable rash of post-apocalyptic novels struck me as the ripest relationship to consider in my dissertation. When I began to plot out the dissertation, I was intrigued by the way these novels seems to be operating, simultaneously, with uncanny precision in their estimations of the scope of our current crises and with a wildly inaccurate sense of what to do in the face of these various cataclysms. I began to trace this seeming paradox of acuity to their role as national allegories. U.S. post-apocalyptic novels, in particular, struggle with how historical change takes place. They seem to want to come to terms with how to maintain the way of things in the face of knowledge that this might not be the most equitable, ethical, or environmental way of life. Their main theory of history seems to be that of rupture—that only the apocalyptic event could restore order, enabling a return, or just a turn, to a mode of social organization that will restore the promise of what the U.S. could be. The problem for a critic reading these novels is that this is a corpus composed of exceptions. The way they represent the apocalyptic break and what they will suggest should follow in its wake varies wildly from one novel to the next, which makes the post-apocalyptic novel as form into a site of contest. The inversion of Kermode’s apocalyptic narrative turns the post-apocalyptic novel into a veritable sandbox for storytelling. 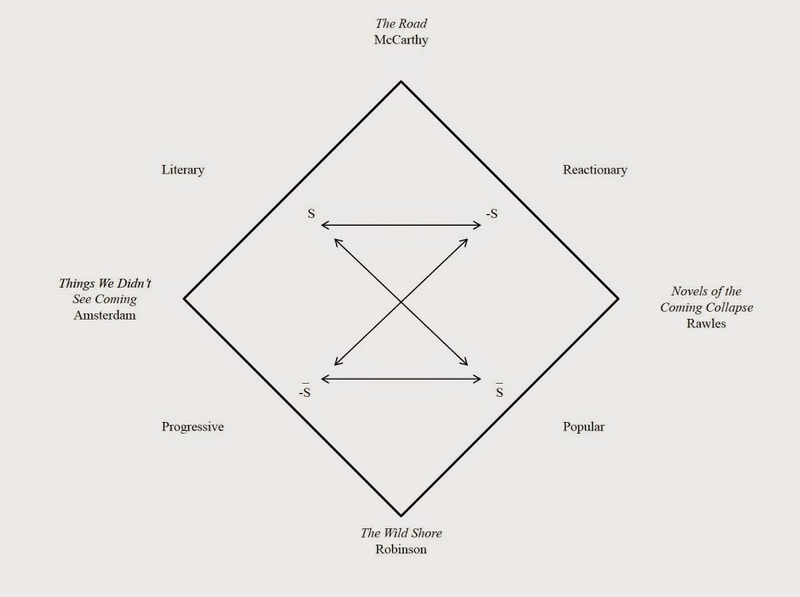 Along with those first two coordinates of the more popular or literary variants, these novels also struggle politically over what is to come. For instance, on the one hand, James, Wesley Rawles’s Novels of the Coming Collapse take a libertarian position, placing the individual and that individual’s allegiance to a cadre of trusted militia-survivalist patriots at the core of its post-apocalyptic enterprise. The United States have collapsed and anyone from on the road, whether they are cannibals carrying copies of Mao’s little red book, I kid you not, or folks claiming to be from the U.S. government, they are not to be trusted. Rawles’s novels make a political bid through their encyclopedic form, which is codified in their extensive glossaries: these will be novels people learn from and look to in the event of actual crisis. On the other hand, Kim Stanley Robinson’s The Wild Shore (1984)—the first novel in a trilogy that imagines three different versions of Orange County, California—brings a realist approach to the post-apocalyptic novel. The novel meditates on what life might look like in the wake of a targeted apocalypse: the fictive conceit of The Wild Shore is that a world government banishes the United States to technological backwardness and political obscurity through a nuclear strike. The politics of Robinson’s novel are equally contained in the form: the novel is a kind of microcosm of the Three Californias trilogy precisely because it presents multiple social ontologies in conflict without judiciously selecting one as dominant or preferable. Robinson, rather than fantasizing about how history could consecrate his politics, depicts a rich, plausible post-apocalyptic world. As an aside, I have included my mapping of this novel with the Jamesonian adaptation of A.J. 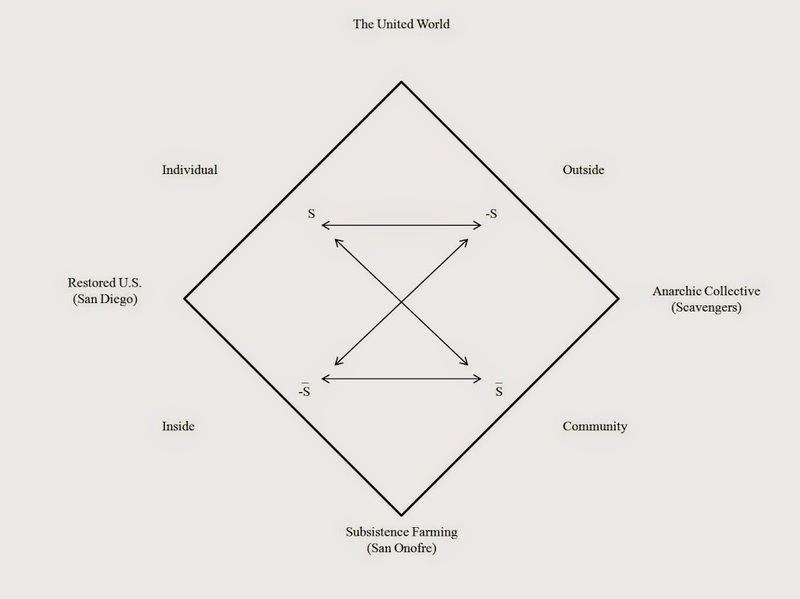 Greimas’s semiotic square. I would be happy to offer further explanation of this device after my talk. “its multiple mock futures serve the…function of transforming our own present into the determinate past of something yet to come” (Jameson 2005, 288). “In a world whose basic coordinates are under constant flux from eruptions of ecological crisis to the emergence of genomic science, from the global realignments of religious fundamentalism to the changing parameters of liberation theology, from the ongoing unfoldings of antiracist activisms worldwide to the struggle for LGBTQ rights, the estrangements of SF in all its forms, flavors, and subgenres become for us a funhouse mirror on the present, a faded map of the future, a barely glimpsed vision of alterity, and the prepped and ready launchpad for theory today” (Canavan and Wald 2011, 247). Thus, the contested politics of the post-apocalyptic novel could be read as a contest over the future of the state and the social in the wake of the political uncertainty generated by U.S. economic decline and military action on the world stage. Because the post-apocalyptic novel’s imagined futures are contested, they invite an engagement with literary form, history, and politics that has implications for understand the relationship between U.S. hegemony, global capital, and the possibility of a more equitable future. The political stakes of my research are that we can and should know the world, especially in the face of the relentless accumulation of capitalist production and its devastating social and environmental effects. My dissertation does not offer a grand scale mapping of literary endeavours and elements, nor does it offer a molecular assessment of each novel’s humming particularity; rather, it immanently studies the U.S. post-apocalyptic novel against the historical conditions of U.S. declining hegemony. In this way, my project takes its cue from American Studies, which invites a number of methodologies and approaches under one roof in order to see where the tensions lie and, crucially, where they might lead. Indeed, as I develop this study for publication, the production of U.S. post-apocalyptic novels continues unabated as does their political contest. In light of recent developments and the insight they offer, I find myself returning to a symptom only briefly mentioned in this talk: the talk of fuel in California and The Dog Stars. How are the post-apocalyptic novel and its settings sustained by the ideology of energy? Do post-apocalyptic novels offer a vantage from which to assess what critics have come to call petroculture? Does the contested politics of the post-apocalyptic novel read differently, with more urgency perhaps, when considered in light of our current anthropogenic climate crisis? These questions are meant to tantalize. Please do feel free to stay for the discussion of my thesis and, whether you stay or other have places to be, thank you for coming. Amsterdam, Steven. Things We Didn’t See Coming. New York: Anchor Books, 2009. Gerry Canavan and Priscilla Wald. “Preface.” American Literature 83.2 (June 2011): 237-249. Heller, Peter. The Dog Stars. New York: Alfred A. Knopf, 2012. Lepucki, Edan. California. New York: Little, Brown and Company, 2014.